We are excited to let you know about a special competition The Walt Disney Company is running exclusively with Inspire's publishers CPO. Enter to win a ticket to a special grandchild/grandparent* launch of Mary Poppins Returns in Disney’s own screening room in London! 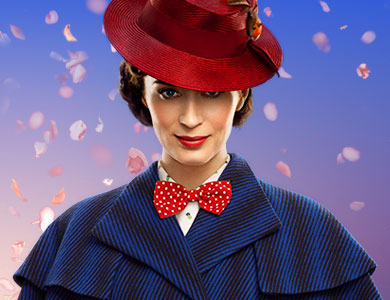 At 11:30am on Wednesday 10 April pairs of grandparents and grandchildren will be welcomed with refreshments and have their photos taken alongside a Mary Poppins display, before moving into Disney’s own screening room to watch Mary Poppins Returns. After the film they will be the very first people to use Ethos Media's Family Activity Booklet, creating some lovely mementos of the day to take home together, and having more photos taken with their creations. “The cover is not the book so open it up and take a look” sings Mary Poppins in the music hall scene. So we provide an activity for young people to create a film-themed book containing memories of their grandparent. “Whenever I lose my way, I just look for a little light to guide me” sings Mary’s friend Jack in the lamplighters’ song and dance routine. So we provide an activity for young people to create a film-themed lantern on which they write their hopes and dreams for themselves, their family and the world; and to reflect on how their grandparent can help them find a light to guide them on their way. The young person must be aged 6+, and the older person must be aged at least 50 – there is no upper limit for either! Winners will be selected and notified by email after the closing date for entries, which is 12 noon on 6 April. Entrants need to be UK residents and able to get to central London in good time on the day.